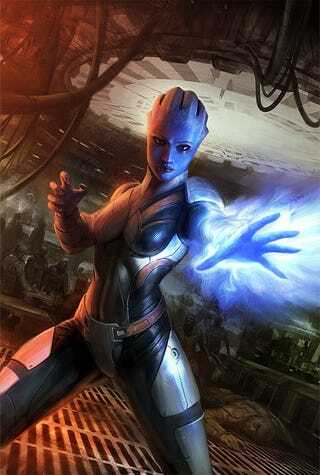 Add BioWare's Mass Effect to the growing list of video games properties becoming comic book series. Electronic Arts and Dark Horse revealed Mass Effect: Redemption today, a series set before the events of Mass Effect 2. Mass Effect: Redemption will be written by BioWare's own Mac Walters, responsible for the Mass Effect 2 script. Handling scripting duties on the comic book series, however, will be John Jackson Miller, responsible for storytelling on Star Wars Knights of the Old Republic and The Invincible Iron Man. Omar Francia, Star Wars Legacy artist, will be handling the visuals. And, not by coincidence, both Francia and Walters will be autographing a Comic-Con 2009 exclusive Mass Effect signing card at the Dark Horse booth on July 24th at 4:00 PM. Walters promises that Mass Effect aficionados will be "pleasantly shocked by the events in these comics" saying that Redemption will change the way you'll look at the upcoming Xbox 360 sequel. The Dark Horse published series starts January 6, 2010.